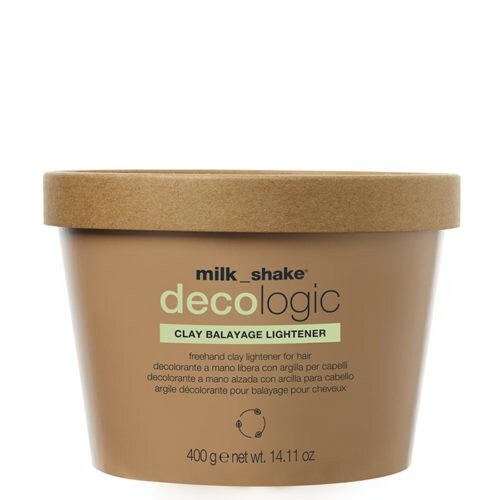 milk_shake® decologic clay balayage lightener is a freehand clay lightener for hair. It is a lightening formula suitable for all freehand techniques, it doesn’t run or expand and adheres perfectly to the hair. Perfect to create partial lightening without using any support to section the hair and without staining the hair. The lattice structure of the Brazilian clay within the formula creates a barrier and protects the hair sections for optimal lightening and a precise and accurate result. Also enriched with organic cranberry extract and silk proteins for hair protection and conditioning. Lifts up to 4 levels.